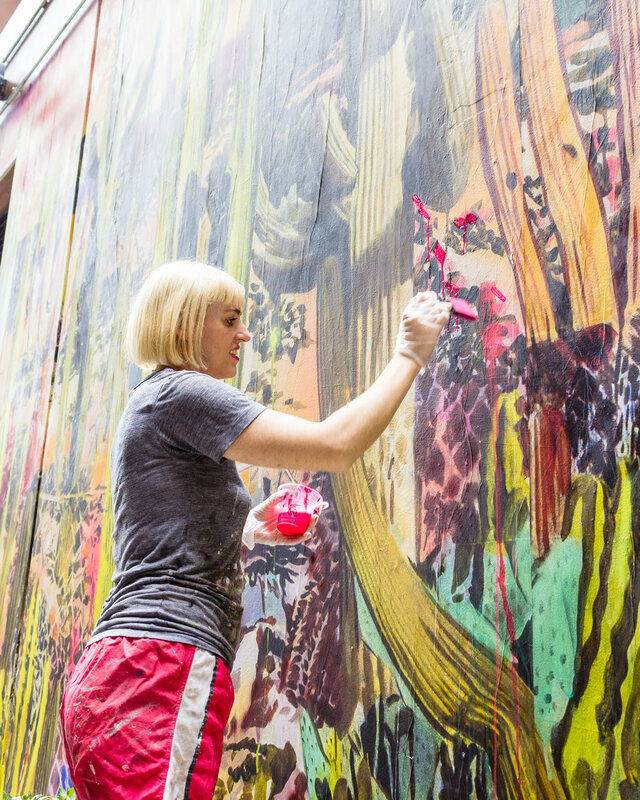 Rosson Crow creates densely layered panoramas on a massive scale. Incorporating everything from shop aisles and neon signage to discarded beer cans and bumper stickers, her work is definitively LA and amends the concept of landscape as ‘trees-mountains-river’. In her short but intense career, a skillful depiction of space has engaged intricately stratified deserts, scenes from key places in American history, and California’s landmarks of iconic cult status. The artist herself is as timeless and multi-dimensional as her works, obsessed with Americana and historical misremembering and simultaneously on the pulse of contemporary art and culture. All set stage, oversized, and meticulously detailed, the works both entice disorientation and compel the viewer to step inside. A recent exhibition at the Museum of Contemporary Art Tuscon, titled Westification, brought together a collection of desert scapes and her most expansive works to date. Brightly colored, they present dense strata of cacti that glow hot and cold with the changing atmosphere. As with the desert works, discarded objects, tchotchkes and ephemera mingle within the plant life of the famous greenhouse designed by Albert Kahn in 1902 and inspired by London’s Crystal Palace.